Millennium of Russia, with St Sophia Cathedral in the background. The Historic Monuments of Novgorod and Surroundings are a veritable 'conservatory' of Russian architecture of the Middle Ages and later periods (11th-19th centuries). (Veliky) Novgorod in North-Western Russia was an important center on the trade route between the Baltics and Central Asia. It developed into one of the major centres of Russian culture and spirituality. St Sophia Cathedral, built between 1045 and 1050 the first one to represent original features of Russian architecture (austere stone walls, five helmet-like cupolas). The Novgorod Kremlin, traditionally known as the Detinets, also contains the oldest palace in Russia. In September 2018, I took an early morning train for the three-hour trip from Saint Petersburg to Veliky Novgorod, founded in 859 and traditionally considered the cradle of Russian statehood. 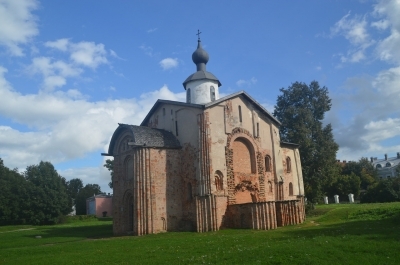 Veliky Novgorod is now recognized for dozens of medieval monuments, including monasteries, churches and Kremlin, all added to the list of World Heritage Sites in 1992. But the memory of the bear sausage I ate at lunch at Dom Berga will linger longer than that of Russia’s foundational religious buildings. After recently visiting Chernigov in Ukraine, I’ve had an urge to write about my admiration for this related city of Veliky Novgorod in Russia. I have visited this city twice, in summer 2005 and winter 2009. I like this city more than any cities in the Golden Ring of Moscow simply because it seems to be historically more important and there seem to be more variety of attractions here. I can’t remember how I got there from St. Petersburg, except that one of the two times I got on a bus from the main bus station in St. Petersburg, which was somewhat far from any of the train stations in St. Petersburg. Veliky Novgorod is the oldest city in Russia. The so-called first capital of Russia was created by the Vikings (as the theory goes) in 9th century before the creation of Kievan Rus. 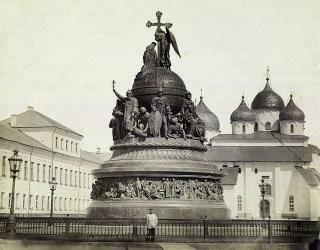 The Millennium of Russia monument was erected in 1862 to celebrate one millennium anniversary of the Russian statehood. 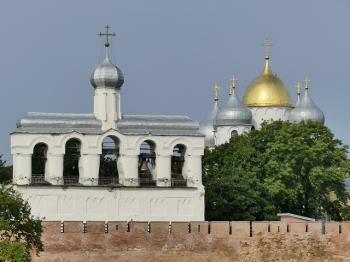 It seemed that Novgorod had the greatest density of churches of all the places I have ever visited. 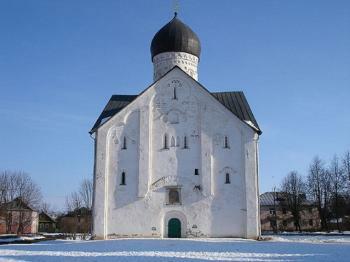 Another church, which is noticeably singled out in the UNESCO’s reasoning for the inscription, is the Church of Transfiguration (Photo), with the frescos painted by Theophanes the Greek, whose relation (as the mentor) to Andrei Rublev was well-documented in the Russian cinematic giant Andrei Tarkovsky’s masterpiece “Andrei Rublev” (1966). This church was actually one of the reasons I went back to Novgorod in 2009. In 2005 I was there on a Monday when the Church was closed. Another reason I visited Novgorod again was because I was actually heading further south from Novgorod to Staraya Russa, a village most famous for the summer house (now a museum) of Fyodor Dostoyevsky and as the main setting for his Brothers Karamazov. To think about it, this village is a great choice for a missing nomination! I visited this WHS as a day trip from St Petersburg in September 2017. The old city of Veliky Novgorod lies some 200km away from St Petersburg and is quite easily reachable by train, bus or car. Since I wanted to visit early before the very few Russian tourists and since I found a good chauffeur service offer, I opted for the latter and arrived at around 9am. The Kremlin opens at 6am but all the buildings are accessible as of 10am, apart from the main church where a lovely Sunday mass was being celebrated. There's just a small billboard stating Novgorod's inscription on the WH list but no plaque. After a short stroll around the buildings within the Kremlin, I headed towards the bridge which crosses the Volkhov River and which leads to Yaroslav's court and marketplace. The panoramic view from the bridge is breathtaking on a sunny day with the red Kremlin wall and the church onion-domes (photo). There are a number of pretty old churches with different Russian architectural styles opposite the Kremlin and some have very old frescoes still visible. The cathedral of St Nicholas is worthy of mention for its colourful fragments of frescoes from the 12th century. If you're not in a hurry I recommend walking around the Kremlin walls to be able to appreciate the different towers. In the afternoon, I also visited the Yuryev (St George) monastery and the colourful interior of the Cathedral of St George. All in all I really enjoyed my visit here and I would rank it on the same level as Sergiev Posad as a WHS. Novgorod or it full official name, Veliky Novgorod which means the Great Novgorod, is an oldest city in Russia and the ancient political center of early Russian state, is well located in the middle of popular tourist route of Moscow and St. Petersburg. To reach Novgorod, I took a night train from Moscow. The train was arrived in early morning; the whole town of Novgorod was still sleeping when I reached the city center. After few directions confusing, I finally saw the large red wall complex of the ancient Novgorod Kremlin. The towers along the wall were fascinating with fairytales-like turret and in a very good condition. Inside the wall, there was a large square with big monument named 'The Millennium of Russia' the monument was full of details of important historical event of this country. Apart from the monument, there were church and palace complexes inside the Kremlin, but all of them were closed during my visit. Nothing to do I just walked around the complex, I found a group of bells in front of one church was quite astonishing with their large size, and wondered why they were here on the ground. Then I walked around the Kremlin wall, admittedly that I really enjoyed the wall more than the Kremlin inside, the color of the wall and its proportion was just right and really photogenic. Then I went to see the riverside, there was a large monastery on the other side of the river. Before I decided to cross the river, there was a sudden really heavy snow, so I had to walk back to Kremlin to find shelter. After seeing Kremlin covered in thick snow, my friend and I decided that we should went back to the train station as the weather was bad to linger on in Novgorod. A local recommended us to use the bus instead of the train, so we went to bus station and took a next bus to St. Petersburg. It was only 3 hours I spent in Novgorod; it was a very quick visit and full of obstacles, but quite enjoyable trip. However Novgorod Kremlin cannot be compared with Moscow Kremlin in any sense, the complex exterior was quite simple and plain with no extravaganza decoration similar to Moscow. 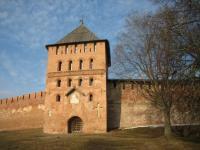 Also Novgorod Kremlin was lack of charm or atmosphere compared with other plain Kremlin in Rostov or Pskov. The historical value of Novgorod was the reason to visit the place, but if you are not a Russian history enthusiast or World Heritage Site seeker, there are other better places to see beautiful Russia than Novgorod. My wife and I went on a day trip from St. Petersburg to Novgorod. Getting there was eventful because of the stern scrutiny we got from the immigration officials on leaving the cruise ship and a lack of public restroom facilities. Our tour guide finally begged the owner of a small restaurant to let us use their outhouse. 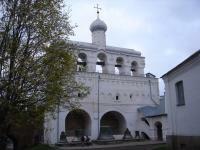 Once in Novgorod we were able to walk around the old market area and churches where the old open air market stood. Much of the area was damaged in World War II and the churches are still ruins. We walked over the Volkhov River bridge to the walled fortress/kremlin which is wonderfully restored. Ancient St Sophia cathedral was a fascinating church, one of the oldest in Russia. There is a very somber commemorative section of the kremlin park for the millions who lost their lives in World War II. We enjoyed lunch at a restuarant in one of the old fortress towers and shopped in the street market just outside the main gate. Getting rubles was tricky, since there were no foreign tourist facilities we could see. People were friendly, and we enjoyed our day there. We also drove out to Yuriev Monastery and visited the cultural historic park nearby where we saw 15 or 20 wooden buildings which have been moved to the site. People dressed in traditional costumes demonstrated traditional crafts and visited with Russian tourists, though none of them spoke English, except to say hello. The wooden church tower bells rang out as we were leaving. This was our only chance to see Russia outside large cities. We would definitely recommend a visit to Veliky (Great) Novgorod. Buying a train ticket in Russia is an adventure in itself…. have I found the right counter? Will they understand English? Will they rip me off? Will the ticket be correct? But with some assistance from the locals and a smile - which must be something added after the Soviet Union collapsed - I eventually got my ticket to Novgorod the Great, 200 km south of St.Petersburg, and hoped on the fully booked train for some three-and-a-half hour travel through the marchlands on tracks that certainly seen their best days. Tourists do end up in Novgorod, but usually just for a short visit on a day trip between Russia’s main attractions Moscow and St.Petersburg. But there is still much to see in this historic town and Russia’s first capital. Walking outside and inside the old Kremlin is certainly not the same experience as in Moscow but with combined visits to the impressing Yurev Monastery and the Museum of Wooden Houses outside the city, and maybe a slow stroll along the river Volkov, Novgorod the Great still has a charm of it’s own and one can just imagine how life would have been here over 1000 years ago when it was founded. By Bureau, and not discussed by WHC that year: reformulation of the title requested, to "Historic Monuments of Novgorod" from "Historic Centre of Novgorod". Damaged in World War II: German troop destroyed Nereditsa church. Golden Horde: "It was through talks with the Golden Horde that Alexander Nevsky prevented a Mongol raid on Novgorod."